Yesterday, Governor John Kasich signed a new law that requires that medical marijuana be available in Ohio within two years. With the stroke of his pen, Ohio joins the growing number of states that allow marijuana products to be used for specified health conditions. The Ohio law is being depicted as more restrictive than some medical marijuana laws, primarily because it does not permit the smoking of marijuana, only the use of certain edible products, patches, oils, and vapes. In addition, physicians can properly prescribe marijuana only for a list of 20 specified and serious medical conditions, like Crohn’s disease and epilepsy. The only condition that might have a little wiggle room allows use of marijuana products for pain that is either chronic or severe and intractable. One apparent goal of Ohio legislators was to avoid the more open-ended approach of states like California, where the prevailing perception is that cooperative doctors freely diagnose new patients as having conditions that allow them to go to nearby shops, buy weed, and toke up. Ohio tried to deal with concerns that the more lax approaches are de facto legalizing marijuana for recreational use by continuing to ban smoking and by calling for significant regulations to be issued by multiple administrative bodies. To that end, the law establishes a commission that will advise state agencies on medical marijuana issues, and the Department of Commerce, the Ohio Pharmacy Board, and the Ohio Medical Board all will issue rules and regulations in the coming months. The rules to come will address the entire medical marijuana process, from selection and licensing of growers, to development and sale of products, to oversight of actual prescription and use of the permitted products. The law also leaves employers free to continue to set their own rules about marijuana use by employees. If workplace policies ban consumption of marijuana by employees, an employee who has a prescription to use marijuana products can nevertheless be fired by the employer for violating the workplace policy. There’s still a lot of work to be done, but the new law reflects the “Ohio approach” that is so familiar to those of us who live here — cautious, incremental, middle of the road, and the product of multiple compromises between competing viewpoints. It won’t place Ohio on the cutting edge of marijuana laws and regulations, but it does let the Buckeye State put its toe in the water. I got to our Schiller Park voting place early this morning, shortly after the polls opened at 6:30. Turnout looked high among the pre-work voting crowd, with long lines curling out the door for many parts of the alphabet. 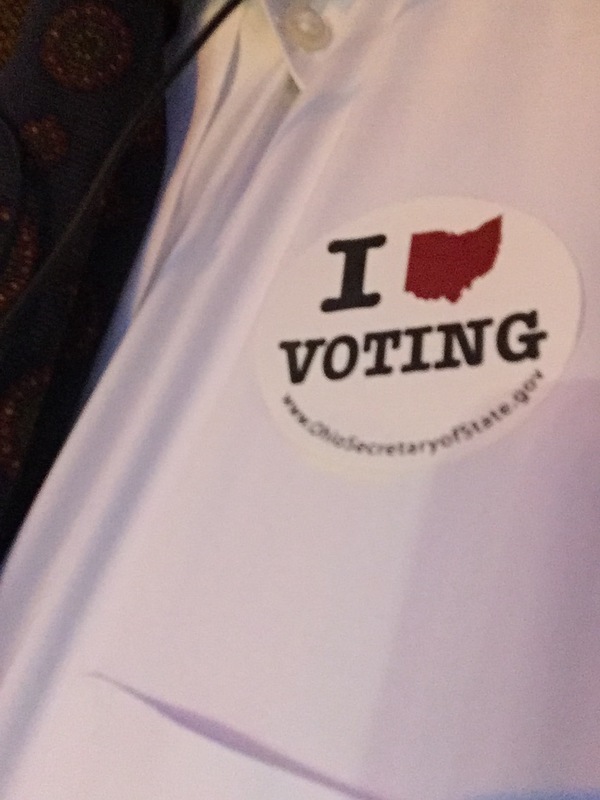 I cast my ballot for Governor Kasich and proudly donned my voting sticker. No exit pollsters asked how I exercised my franchise. Now, we wait. C’mon, fellow Ohioans — make your voice heard!